Tax Day isn’t something that most think to celebrate, but for Victor and Felipa Rodriguez Garcia of McIntyre, Ga. the day came with two reasons—the birth of their 6 lb., 8.6 oz. baby girl this morning at 1:27 a.m., and a college savings contribution for baby Rose, who was the first baby born at Navicent Health on April 15—Tax Day. “We are very happy and very glad, very thankful to receive this scholarship,” said Felipa Rodriguez Garcia, baby Rose’s mother. Felipa also said her family feels very blessed to have a baby girl. Baby Rose has two older brothers at home. This is the fourth year that Navicent and the Path2College 529 Plan have partnered to recognize “Tax Day” babies in an effort to raise awareness about the importance of saving for college and financial planning. “It is such a pleasure to welcome little Rose into the world by investing in her education. I personally believe that education is vital to an individual’s success. As an organization, Navicent Health participates in numerous initiatives to promotes the education and continued learning of our employees as well as those within the communities we serve. We are pleased to partner with Path2College to navigate Rose towards a path to success,” said Dr. Ninfa M. Saunders, President and CEO of Navicent Health. 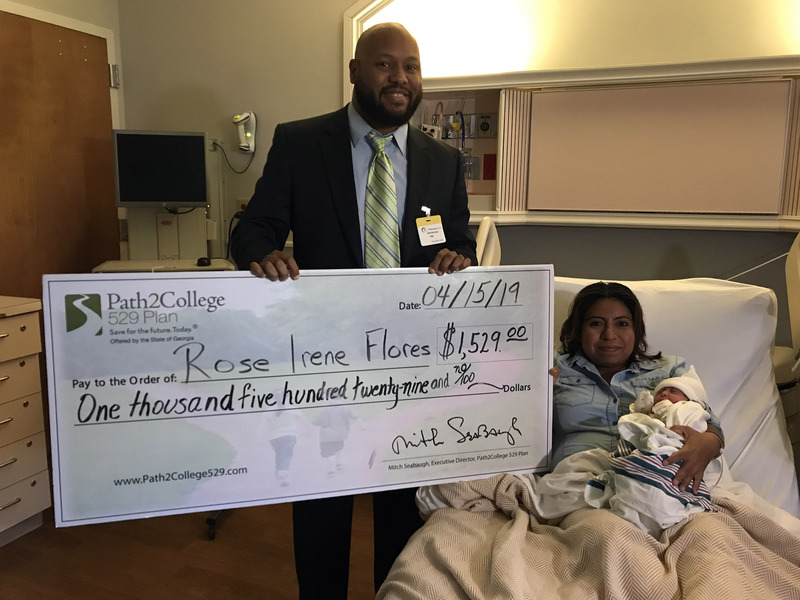 In addition to recognizing the first Tax Day baby at Navicent Health, the Path2Collge 529 Plan also kicked-off its 2019 Newborn Sweepstakes, which will award one baby born in Georgia this year a $5,529 college savings contribution. The Path2College 529 Plan will also award $1,529 to the hospital where the Newborn Sweepstakes winner is born.